Alden Projects™ announces its participation at NADA Miami Beach 2012 (Booth P11 in the Napoleon Ballroom). This year’s project: California Dreaming (Is Still For Sale), an installation including signal works by, or residual reveries of, California artists John Baldessari, Ed Ruscha, and Eleanor Antin (1963-1973) among others. These West Coast artists all re-imagined photography--and re-oriented photographic practice--in the service of a conceptual dream: art that traveled beyond the confines of the gallery frame/walls and art that was widely available, inexpensive or even freely transmitted. Baldessari’s seminal photographic portfolio, Throwing Three Balls in the Air to Get a Straight Line (Best of 36 Attempts)(1973) explores the roll of photographic chance and choosing, but also marks the given limits of the photographic frame itself (Kodak’s 36 exposures per roll) in the form of a (then) inexpensive, widely available portfolio of loose photographic plates—but which has become otherwise uncommon (and let’s be honest: less democratically priced). 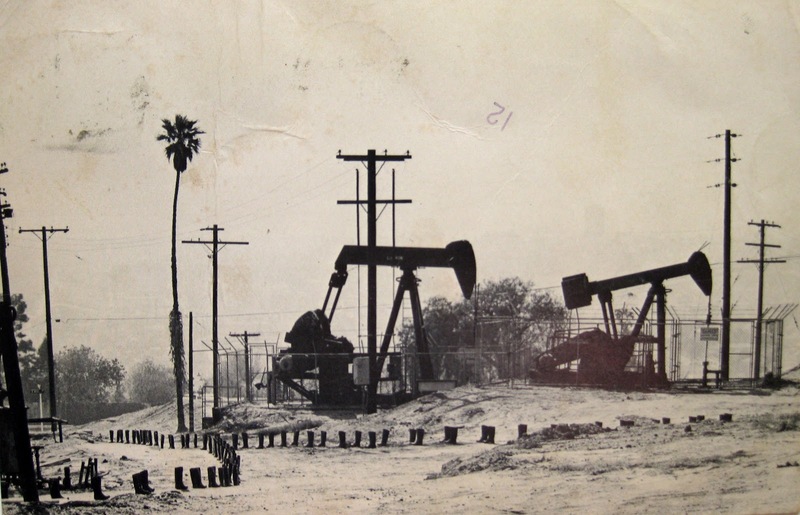 Today, we see it reproduced again and again in catalogues and on museum banners announcing it as a Greatest Hit of Conceptual art and as an instantly recognizable flag for California conceptualism, branding Los Angeles as a dreamy art capital with history. Eleanor Antin’s series of photographic postal works, 100 Boots (1971-73) consists of a traveling battalion of 100 Army & Navy surplus black rubber boots stage-photographed literally “on the road,” mostly in California, but also in New York, printed as postcards, and sent to a changing mailing list over the span of more than two years to select, art world participants with each card announcing a new alternative reception event/context. Antin’s 100 Boots landed at the Museum of Modern Art in 1973—in one of only a handful of one-person exhibitions by female artists there that decade. 100 Boots is on view at MoMA again today (now hanging in the permanent collection) and also at the Brooklyn Museum in the Materializing "Six Years" exhibition. Antin’s 100 Boots have come full circle from surplus to center stage and as avatars of the era’s Dematerialized Art. 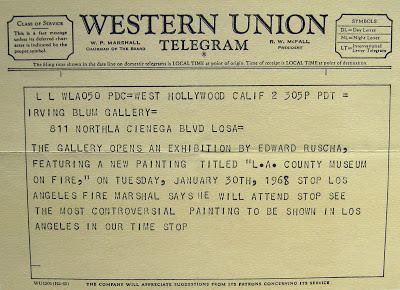 At a time when many artists preferred to allow their gallery to conceive their exhibition publicity, Ed Ruscha—a former printer’s devil--released a series of graphics that are arguably as compelling in design and concept as were the artist’s unique works. Widely unseen, Alden Projects™ is pleased to present a complete collection of Ruscha’s 1960s posters created for one-person exhibitions at the Ferus Gallery and Irving Blum Gallery. These graphics, distributed freely, arguably functioned in a manner analogous to his other contemporaneous, perplexing publications (e.g. his books), which the artist describes “as wolves in sheep’s clothing”. In other words, Ruscha snuck his powerful art—and artistic message—into mechanically reproducible, and distinctly non-art vehicles. (Like Warhol, only more so). 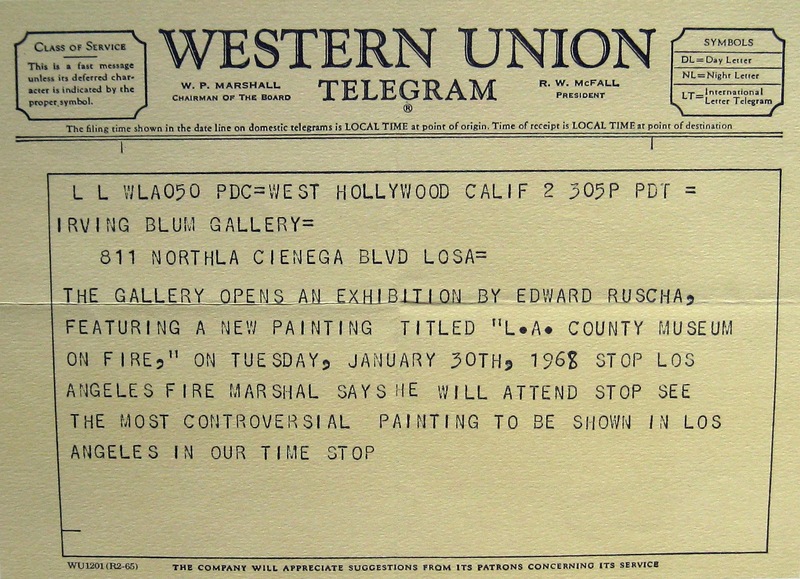 Like his books, Ruscha’s early exhibition posters traffic in the stealthy business of announcing his (extra-) artistic events with surprise, wonder, and “a kind of huh?” Widely unseen, and mostly under accounted for in the artist’s literature, Ruscha’s graphic and dead-pan California dreaming from the 1960s is reconsidered…on a winter’s day. Pursuing other dreams, Alden Projects™ also presents early and important 1960s ephemera, including rare posters by Andy Warhol, Roy Lichtenstein, Robert Rauschenberg, Yoko Ono and George Maciunas. From the darker 1980s, we have unearthed a seldom seen print by Robert Longo related to his Men in the Cities series (and including a hand-written menu on the verso for a 1987 Aids benefit). Also: rare ephemera by or about Jean-Michel Basquiat, including Basquiat’s first poster from 1982, a screenprint. One of 35 examples printed. Circling back to Los Angeles, we are obliged to mention our inclusion of Claes Oldenburg’s 1963 Dwan Gallery poster, incorporating an image of Mickey Mouse for the first time in the artist’s oeuvre, together with a red heart. 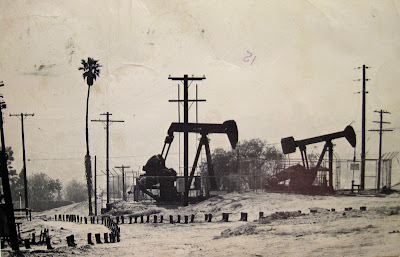 We are left wondering if this Los Angeles commemoration--this California dreaming--signals a black romance, a red menace, or a cartoonish future? California Dreaming (Is Still For Sale)…an installation at Alden Projects™ in the Napoleon Ballroom (Booth P11) at Nada Miami Beach 2012.